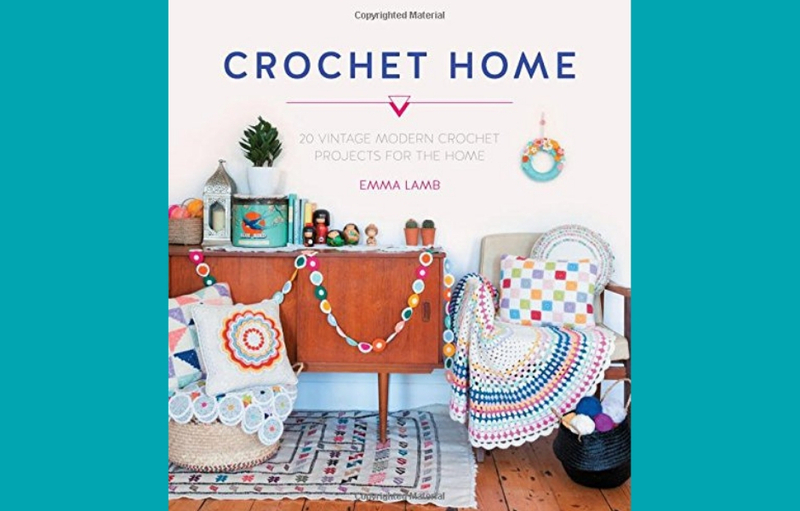 According to the author profile at the end of the book, “Emma Lamb is a British crochet designer and blogger living in the beautiful city of Edinburgh, Scotland” who “draws inspiration from the Scandinavian aesthetic, mid-century design and her everyday life”. Crochet Home is her first book, published by D&C, the same publishers as Toft’s famous Edwards Menagerie. The cover features a living room interior with 1950s style furniture, decorated with crochet items in a pleasant colour palette mixing brights and pastels that are brought together with a lot of white. Like any good crochet book, this one starts with a section about how to go about using it and I love the fact that the very first information given is that Emma uses UK crochet terms throughout. The introduction on how to read the charts is really good and thorough – I get ridiculously excited when a crochet book contains graphs! I’m not so sure about the huge emphasis Emma puts on tension and blocking given that this is a book of homeware, so the exact size of the finished item doesn’t really matter that much (although she does make a good point about the risk of running out of yarn if the tension is way off, which is fair enough). Emma recommends steam blocking everything, which makes sense if people use the same yarns as she does (i.e. only natural fibres) but if somebody decides to substitutes the original yarn with acrylic, that would really not end up so well (acrylic is best wet-blocked and left to dry). There is a very clear graph for every pattern, which, as I said before, I love. (I am so happy this is becoming more and more common!) There are also some very clear and helpful yarn substitution notes. One of the items (a garland) uses something that I had never heard of before: Paperphine paper twine – I’m going to have to try this myself! This book offers a variety of patterns for the home, as the title suggests: a few different garlands, a wreath, a dreamcatcher, a wall hanging, many potholders, a few cushions (including one with a rather complicated way to make a pinwheel patchwork pattern that I am not entirely sure is worth the effort), some blankets and even throws – one of which Emma calls a floor throw… wouldn’t that just be a rug? Most items are made up of many individual pieces that have to be attached together and the floor throw/rug is the only big item worked in one piece (and as I don’t like putting together lots of small fiddly things, the only item I would actually consider making myself). The book ends with a Techniques section, which provides very clear pictures. However, the aesthetic decision made to have only three pictures per stitch works fine for the smaller stitches but makes the longer stitches (from the treble onwards) rather confusing. So, although some patterns are pretty simple, I would rule out this book as a learning tool for complete beginners. It’s a book that is very pretty to look at (it oozes comfort and calm) and that opens up many possibilities if you are willing (and able!) to take inspiration from Emma’s designs and make them your own.